Building #19’s ad for windows from the John Hancock building hinted at the product’s origins with signature humor. For nearly half a century, Building #19 was the place where old merchandise went to die. The Hingham-based chain became famous for its rock-bottom prices on an ever-changing assortment of irregular, surplus, or salvaged goods — tools from school cafeterias, oriental-ish rugs with the occasional water stain, polo shirts bearing the logos of banned Internet gambling sites. 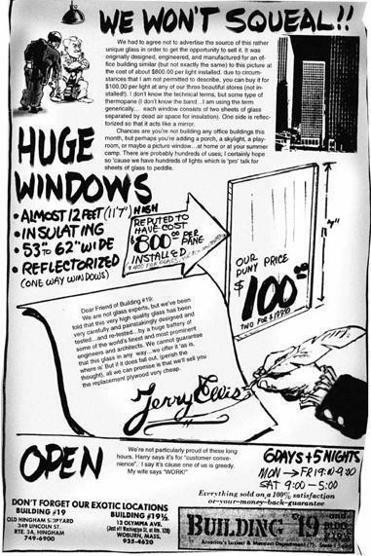 Founder Gerry Elovitz, better known as Jerry Ellis, was hilariously unpretentious about the chain’s offerings, and in its ads Building #19 poked fun at its own products more adroitly than any comedian could. Sadly, the 10-store chain declared bankruptcy earlier this month — a development that’s been chalked up to Internet competition. But, really, is anyone going online for better prices on pants-less business suits and can-less paint can lids? As a priceless interview with Elovitz last week in the Globe made clear, the real challenge that Building #19 couldn’t meet was something else: manufacturers’ and retailers’ relentless drive to squeeze out costs and avoid unpleasant surprises. It’s possible, of course, that Building #19 could have adapted to these changes more skillfully — “I was like an Underwood typewriter in a world of computers,” Elovitz said. Other closeout stores are hanging on; a rival chain, Ocean State Job Lot, is even expanding. But in the meantime, most other companies are working hard to avoid the kind of errors that end up on closeout store shelves. Consumers should applaud that effort, which yields lower prices on the goods we actually need. Yet, it bodes ill for Elovitz’s amusing, too-little-celebrated corner of the economy. We’ll miss the mistakes: the Hancock Tower windows that Building #19 once sold; the reject-pile game dice — zero dots on some sides, nine dots on others — that I once spotted at a competing store. The absurdity of these items was exceeded only by the pleasure of happening upon them.